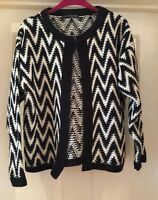 Atmosphere Black & White Cardigan, Size 14 - Lovely! Atmosphere White & Navy Striped Cardigan, Size 14 - Fab! Atmosphere Silver With Sparkle Cardigan, Size 18 - Fab! BNWT Atmosphere Coral Cardigan, Size 16 - Fab!